Introduction: Gena Philibert-Ortega is a genealogist and author of the book “From the Family Kitchen.” In this guest blog post, Gena writes about the value of a resource in newspapers that is often overlooked by genealogists: the classified ads. “Be sure to drink your Ovaltine. Ovaltine? A crummy commercial.”—Ralphie Parker from the movie A Christmas Story. Advertisements: they often seem the bane of our existence. On television, advertisements scream at us every few minutes, interrupting our favorite shows. When you pick up a magazine it seems that more than half the pages are filled with ads for everything from food and household cleaners to prescription medications. Now in the world of Web 2.0, advertisements invade every aspect of our Internet experience, even as a necessary evil when using free apps. In today’s world advertisements are impersonal and contain little family information—but this was not always the case. Ads from an earlier era were different, more personally connected to their audience, and can provide helpful information for family historians. This is especially true of advertisements from old newspapers. When you think of the “important” sections of the newspaper for family history research, what do you think of? Vital record announcements, obituaries, and human interest stories may come to mind as sources of genealogical information. But what about those parts of the newspaper that aren’t considered “content rich”? What about advertisements? As a genealogist researching your family history, why should you care about newspaper advertisements? Well, advertisements in newspapers from yesteryear can help researchers in two ways. The obvious way is that they can provide the name of an ancestor’s business—but they also provide us with social history background that can be crucial in reconstructing an ancestor’s time and place. Consider this strip of ads from an old Kansas newspaper. 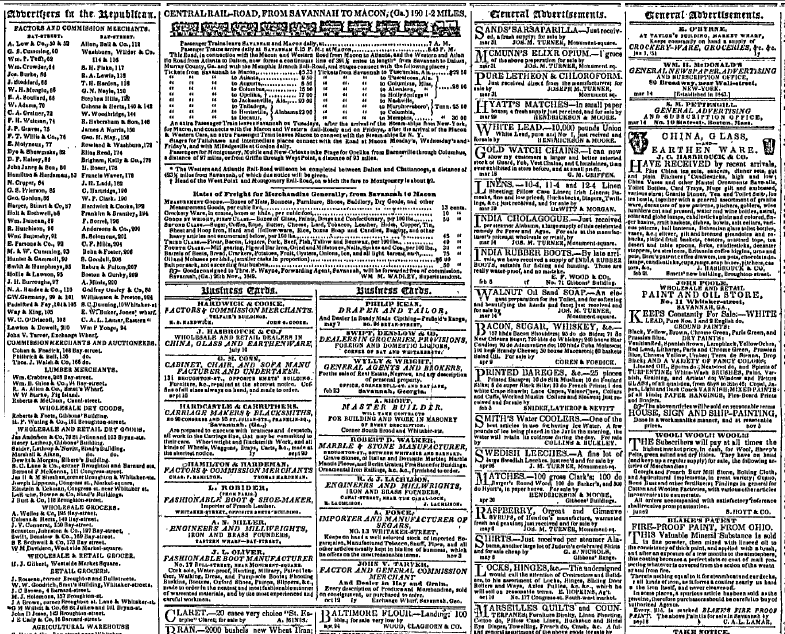 Here are some old classified ads from an 1851 Georgia newspaper. Here we see not only classified ads but a listing of merchant names. Must-have information for our ancestors including fares and stops for the Central Rail-Road and some ship lines are also found on this page. Further down, readers can see that there are notices of public land sales in Arkansas. Do you have an ancestor who started out in Georgia and ended up in Arkansas? Maybe they saw this notice for the land sale and headed west. 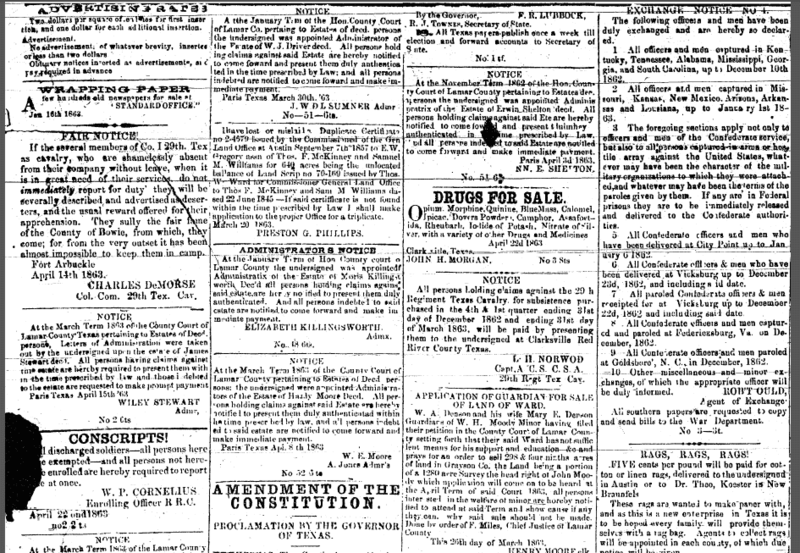 In some cases, historical advertisements can be found with other types of notices, as illustrated in this Civil War-era newspaper from Texas. The advertisements and announcements on this page include notices from administrators of wills, a physician who will begin his practice, and information from the War Department. There are old ads for medicinal drugs that are for sale, presumably at a local pharmacy: opium, morphine, Blue Mass (a remedy that “cured” all sorts of problems including pains from childbirth, tuberculosis, constipation, and syphilis—one of its ingredients was mercury), ipicac, and Dovers Powders (a remedy for colds and fevers that contained opium) are just some of the “medicines” you could pick up. One of the great things about this series of advertisements is that it is a reflection of the times. Note the short notice asking families to save rags because they are needed to make paper. Five cents a pound is offered for rags. During the Civil War, the South experienced all types of shortages including paper. This notice gives insight into these wartime shortages. Can advertisements provide genealogists with answers about their ancestors? Yes! Not only can they provide proof of an ancestor’s occupation but they can also provide a sense of their era. These advertisements provide a much-needed history lesson for our genealogy. While it can be tempting to skip over some sections of a newspaper, don’t skip the old advertisements. They provide insight into your ancestor’s life. Thank you Gena, never thought that much information was being missed. Will need to look at some of that information a bit closer from now on. Gena, you make your point so well in this post! Social history is the medium in which all our ancestors lived, there’s no doubt about it. All this information (which in local newspapers today might be boiled down to an anonymous phone number) was how they acquainted themselves with their surrounding and their neighbors. Instead, we’re often online and very concerned with privacy. I remember my aunt and cousins scanning the local papers for news. I will have to get busy and do some newspaper searches . . . I haven’t made more than a passing effort, so far, but it’s high time I did! Thanks for this post. Having transcribed countless newspaper articles over the past twelve years for Georgia Gen Web, I can also attest to the wealth of information that can be found in old newspapers. It’s possible to find your ancestors mentioned in social columns, church news, court notices, jury members, civic club articles, lost and found notices, etc. Keep in mind that many times newspapers in adjoining counties included mentions of people and local events in the next city/town. When looking for obituaries and other important events, they can be a backup resource. An additional benefit of historical newspaper advertisements is that they provide a peek into activities long since extinct. Consider the millinery and photography store.